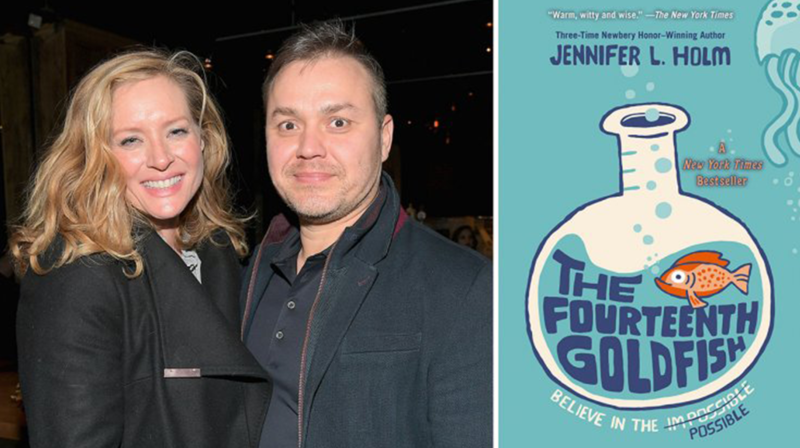 Santa Monica, CA, – Friday, June 8, 2018 – Skydance Media has acquired the rights to the highly sought-after best-selling children’s book The Fourteenth Goldfish written by Jennifer L. Holm. Skydance’s Animation studio plans on developing and producing a feature film based on the popular book with Oscar nominee Theodore Melfi (Hidden Figures) and Kimberly Quinn (Hidden Figures) attached to write and produce. Victor Maldonado (Nocturna, “Trollhunters: Tales of Arcadia”) and Alfredo Torres (Nocturna, “Trollhunters: Tales Arcadia”) from Headless Productions will direct the film with Alessandro Carloni (Luck, Kung Fu Panda 3) serving as executive producer. The Fourteenth Goldfish is an animated comedy about a 12-year-old girl whose middle school life is made even more complicated when her estranged grandfather shows up at her door having reversed his age to fourteen-years-old. Together, they must go on an adventure to stop the technology from falling into the wrong hands. New York Times bestselling author Jennifer L. Holm is a beloved and well-known name in the world of children’s literature. Jennifer’s books have been the recipients of numerous awards and starred reviews. She is the recipient of three Newbery Honors for her novels Our Only May Amelia, Penny From Heaven, and Turtle In Paradise. Her novel, The Fourteenth Goldfish, was a New York Times bestseller, and her book, Full of Beans, won the 2017 Scott O’Dell Award for Historical Fiction and was a New York Public Library Best Book for Kids. In addition to her novels, Jennifer collaborates with her brother, Matthew Holm, on two graphic novel series, the Eisner Award-winning Babymouse series and the bestselling Squish series. Theodore Melfi, Kimberly Quinn, Alessandro Carloni, Victor Maldonado and Alfredo Torres are all repped by UTA. Launched in 2017, Skydance’s Animation and Family Entertainment division is an artist-friendly studio dedicated to producing a bold and original slate of animated programming. Skydance formed a multi-year partnership with Madrid-based Ilion Animation Studios and over the past year has announced the animated feature films Luck, directed by Alessandro Carloni and written by Jonathan Aibel & Glenn Berger; Split (working title), directed by Vicky Jenson and written by Linda Woolverton; and Powerless (working title), directed by Nathan Greno. Skydance is a diversified media company founded by David Ellison in 2010 to create high quality, event-level entertainment for global audiences. The Company brings to life stories of immersive worlds across its feature film, television, and interactive platforms. Its feature films include Annihilation, Geostorm, Life, Jack Reacher: Never Go Back, Star Trek Beyond, Mission: Impossible – Rogue Nation, Terminator Genisys, Star Trek Into Darkness, World War Z, G.I. Joe: Retaliation, Jack Reacher, Mission: Impossible – Ghost Protocol and True Grit. Skydance’s next feature film to release is Mission: Impossible – Fallout on July 27, 2018. In 2017, Skydance formed an animation division to develop and produce a slate of high-end feature films and television series in partnership with Spain’s Ilion Animation Studios. Skydance Television launched in 2013 and its current slate includes Emmy-nominated Grace and Frankie and Altered Carbon on Netflix, Jack Ryan on Amazon, Condor on AT&T Audience Network, and Dietland on AMC. Skydance Interactive launched in 2016 to create and publish original and IP-based virtual reality video games. Skydance Interactive’s first original title is Archangel, a story-driven VR shooter game.